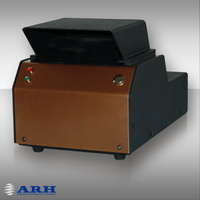 This ARH product has been discontinued and is no longer available. What would you like to do? Please choose one option. Passport Reader CLR device makes data entry, performs authenticity verification of the documents and transfers the data as an information package to the data processing information system in within seconds. Passport Reader CLR takes high resolution images of different types of personal documents (passport, identity card, etc.) using white, infra-red and UVA illuminations.